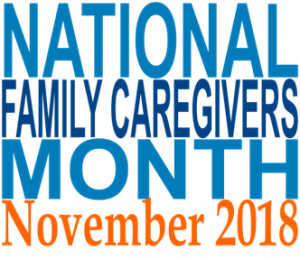 This month — November — is National Family Caregivers Month. If you’ve been in any way assisting another adult with managing health concerns or life tasks, you qualify as one of the estimated 40 million family caregivers in the US. Such help often starts out with small things, such as helping an older relative get to appointments or assisting with grocery shopping. But it’s also fairly common for families to end up providing quite a lot of care. A 2015 report found that on average, family caregivers provided 24.4 hours of assistance per week, and 23% of caregivers were clocking 41 hours or more. Many people find themselves eventually struggling with the caregiving. Most of us haven’t prepared or been trained to do this, and many people are unsure of where to get information, help, or support. So in this article, I’ll share some of my favorite resources to make family caregiving a little easier. The Family Care Navigator feature can help you locate public, nonprofit, and private programs and services in your area. This can help you find government programs, legal resources, disease-specific organizations and more. There is also a free “CareJourney” feature, which is designed to provide customized support and information. It always makes me a bit sad when a stressed out family caregiver tells me how isolated he or she feels. Most of them haven’t gotten around to finding a support group, in part because they are so busy. AgingCare.com Caregiver Forum – This is one of the more active online caregiver forums. It’s a good source of emotional support and ideas for navigating common caregiving challenges. Daughterhood.org – This caregiving site is spearheading local “Circles” to help caregivers connect. SmartPatients Caregivers Community — This community is a partnership with Family Caregivers Alliance. If you’re a family caregiver and you’re wondering which to try: I would say subscribe to one or two communities and give it a few weeks to see how it goes. Stick with the one that has a vibe or style that feels helpful to you. I really do think it is essential to connect with a group of people facing similar family caregiving challenges. Online groups provide a safe space to vent difficult emotions, validation for your efforts, practical ideas on how to move forward and — perhaps most important — reminders to set some limits and tend to your own needs too. Aging Life Care Association – Formerly known as the National Association of Professional Geriatric Care Managers. This site explains how aging life care professionals can help with common age-related challenges, and provides a directory to help you locate a professional. These professionals usually have to be paid out of pocket, but they can be a huge help for families providing care at a distance, or just if you need extra help problem-solving. National Elder Law Foundation – This is the only national organization certifying practitioners of elder and special needs law; NELF’s Certified Elder Law Attorney designation is itself certified by the American Bar Association. The site includes a feature to help you find a certified elder law attorney near you. National Academy of Elder Law Attorneys – This is a larger non-profit organization and community of attorneys practicing elder law. There is a directory available. How to Find Geriatric Care Near You – This BHWA article covers some options for locating a health provider who can offer healthcare adapted to the needs of older adults. Both these books are WONDERFUL comprehensive resources, they suggest websites and organizations to contact for a variety of issues related to helping older adults. Great to have on your shelf! Planning For Long-Term Care For Dummies, by Carol Levine. How to Care for Aging Parents: A One-Stop Resource for All Your Medical, Financial, Housing, and Emotional Issues, by Virginia Morris. This book isn’t relevant to everyone, but since I end up recommending it often when people write to me in the comments, I will post it here. This book can be very helpful if you have an older parent who is demanding or is draining you or is otherwise stressing you out. It also addresses how to more constructively relate to an older person who complains a lot or is very negative. It is especially good for guidance on how to set some healthy boundaries and how to help without necessarily providing everything an older relative wants. Coping with Your Difficult Older Parent: A Guide for Stressed-Out Children, by Grace Lebow and Barbara Kane. What are your favorite resources for family caregivers? Still, I’d love to know: If you’re a family caregiver: what have you found most helpful, when it comes to getting the information and support that you need? And what has helped you find services and resources, to address whatever age-related challenges you’ve come across? Please post your suggestions below, I’m looking forward to learning from you! The post 13 Recommended Resources for National Family Caregivers Month appeared first on Better Health While Aging.